On Saturday, Kim Jones’ first collection for Dior Homme will bow in Paris and from the looks of the teaser materials sent out by Dior in the last few days, Jones is planning to take the brand in a whole new direction. And, honestly, all I can say is thank god! Seriously, a Dior Homme makeover was long overdue and Kim Jones is just the man for the job. I mean, just look at what he did for Louis Vuitton. Every collection he designed for them was fabulous. Every single one. Fresh and chic and luxe and wearable all at once. Not that Dior Homme was awful by any means. Of course not! Kris Van Assche is a very good designer and I’m sure he will do great things at Berluti, but, to be perfectly honest, his collections for Dior Homme always felt a little tepid to me. The clothes were beautiful and beautifully made, but Van Assche’s aesthetic was just so rigid. Not quite as rigid as that of his predecessor, Hedi Slimane, but still! After a while, I just stopped looking, which was maybe silly of me, but it is what it is. I don’t know. Van Assche’s Dior Homme always just felt like a variation on what Slimane did so well before him and once Slimane came back on the scene with Saint Laurent, I just lost interest. 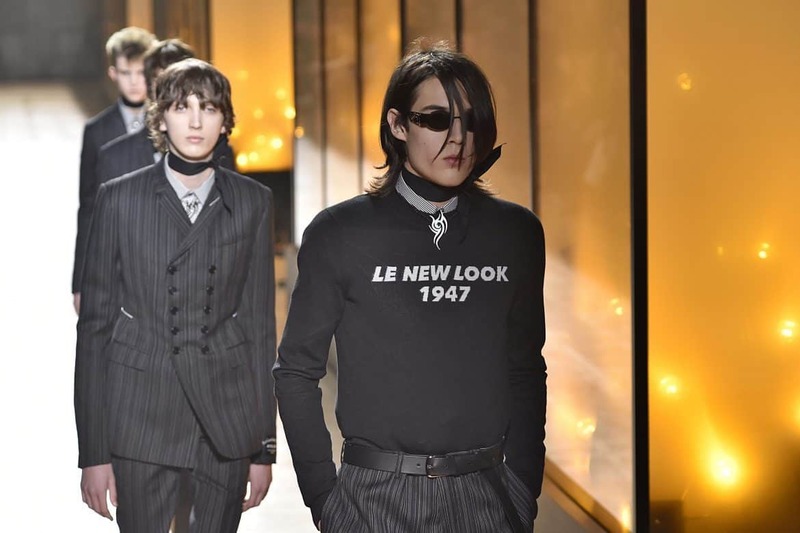 Not that I would call myself a fan of Slimane’s menswear exactly. Waifish boys in skinny jeans and leather jackets feel so tired and heavy-handed to me at this point, but, like, if I want to look at (or buy) something in that vein, Slimane is the guy I’ll go to. None of that matters anymore, though, because Kim Jones is in charge at the house of Dior now and everything is about to change. At least I think it is. I mean, just look at the invitation Dior’s PR team sent out for the show. As you can see, the video invitation features a cute little cartoon bumble bee. It’s downright whimsical — a word I don’t think anyone has ever used to describe a Dior Homme anything. That video was sent to me a few days ago, when Dior first asked me to post a livestream of Jones’ show on this site. I’m not generally a fan of live-streaming shows. I would rather just look at the high-res photos after the fact. And I hate the cryptic little tidbits that brands are willing to share in advance of a new collection. I get it, you don’t want to put the cart before the horse, but come on! What do you expect me to do with fabric swatches and a black and white photo of the venue? This is 2018. I can’t build a story around those crumbs! But then, every once in a while, those tiny crumbs are actually pretty tasty. Take this teaser video Dior sent me today for example. It’s just so totally un-Dior. Or, I guess I should say un-Dior Homme. At least, as I’ve always known it. So even though there isn’t a lot here, I actually found it very exciting. I mean, look at all those flowers! Oh man. Maybe I’m making a mountain out of a mole hill – I mean, I’m definitely making a mountain out of a mole hill – but between this video and the cute little animated invite above, I feel like Kim Jones has something really exciting and fresh and unexpected and, dare I say it, cute in store for us and, personally, I could not be more here for it.